We use the IBM jvm(64bits) (see note: 1090932 & 861215). This is the best VM for linux x86 64 bits. It will ask for an access key that is found in the sap note. First we mount our sap download drive for easy access, you can skip that and copy the files you need by other means if you prefer (ie: ftp, ssh). /etc/java/IBMJava2.conf should still be valid since we are still in a a1.4.2 version. so we shouldn't have to run setDefaultJava either. I usually reboot after that, to make sure all the apps pick the new java and test. You might have to upgrade your Database first (Oracle, MaxDB etc...). Use JSPM as explained here (or see section 2.2 of the PDF). You probably need to upgrade the database first. Not explained here, see http://wiki.colar.net/isa_2004s#oracle_setup for infos. if you are starting from SP4 or lower, see additional steps in my SP6 doc. ssh cisascr -X -l s2cadm "cd /usr/sap/S2C/JC01/j2ee/JSPM; go"
Do "single packages" and for each "cuurently installed" package select the new (latest) version in the list and click next. SAP FREAKING PASSWORD ISSUES ! Of course you can never upgrade ISA without having SAP screwing with the passwords (expiring it and asking for a new one and then failing to apply it properly). It's been an issue since day 1 and still his ... ridiculous BS ! So anyhow, after upgrading one of the components(J2EE ??) it will expire the password (even though we set it not to expire ever!) and then after that it will fail upgrading the other packages since it can't connect itself to the server because of the password ! Open the visual admin and go change the password there. ssh cisascr -X -l s2cadm "cd /usr/sap/S2C/JC01/j2ee/admin; go"
This only does half the job of course, so then you should start the configtool on the server and go to the secure store and put the same passord in there (admin password), then press "add" and the "save" icon. ssh cisascr -X -l s2cadm "cd /usr/sap/S2C/JC01/j2ee/configtool; configtool.sh"
When upgrading from <sp7 directly to >sp11 there is an error when deploying CAF. java.rmi.RemoteException: Cannot deploy application sap.com/caf~UI~ptn~common..
Basically you have to manually undeploy duplicate component: sap.com/caf~UI~servicebrowser with the SDM. ssh cisascr -X -l d2cadm "cd /usr/sap/S2C/JC01/SDM/program/; RemoteGui.sh"
Then restart JSPM again and resume the upgrade. Update should complete after a while (2-3h) total. 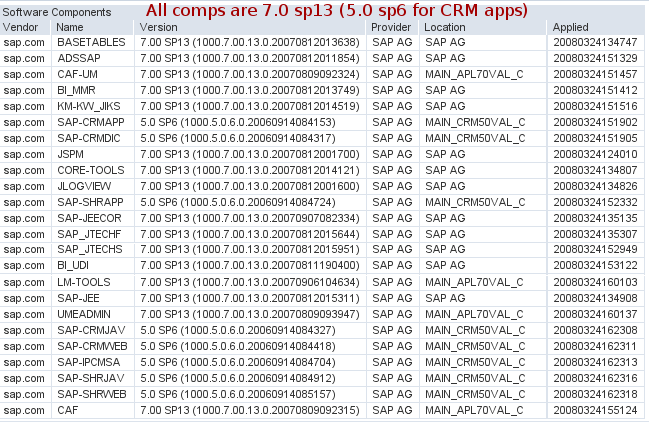 on one of the systems, the JSPM did not pick up SOME of the the new B2C/B2B components (sap-shrweb,sap-crm-web,sap-ipcmsa,sap-shrjav,sap-crmjav), so i deployed those manually with SDM and restarted SAP J2EE.